Today I have Eric Smith, author of “The Path,” with me to give me a little information about this self-help book. * He was kind enough to give me some information about how this book came about and what you can find inside. There are a lot of questions this book boasts answers to, including: how to increase your memory, the correct way to diet, how to deal with stress (good and bad), power listening and the key to building your perfect body. And now, to explain a little bit more about his book, here’s Eric! Trish: Eric, can you give us a little bit about your background and how you got the idea for The Path? Eric: Sure, Trish, and thanks for this opportunity to get the word out. I was a journalism honors student at the University of North Carolina, and a science reporter for the Beacon newspaper in Research Triangle Park, the East Coast’s major technology hub. I dug very, very deeply, and was able to piece together the answers to these questions and a whole lot more, laying out the very bases of thought, emotion, learning, memory, morality, motivation, and perception. In essence, this book is about how each of us works psychologically and biologically, and how to apply this knowledge for maximal performance in every aspect of life. TK: Can you explain a little bit about the writing process behind The Path? ES: It was a matter of asking the fundamental questions of life, and then looking for the answers. Along the way, The Path lays out science for the complete layman, eventually building upon that knowledge to give a thorough grounding in the very latest, explosive findings of genetics, neuroscience, biochemistry, game theory, communications theory, applied psychology, anthropology and more. As I was writing this, it filled me with a tremendous sense of excitement, because I began to realize I had stumbled upon what could be called the ultimate secrets of life – the keys to love, power, health, longevity and success. This may sound like hyperbole, but it’s the real deal, and, when people begin to read what I’ve uncovered, they’re going to be amazed. There really is nothing like this out there, and I believe without a shadow of a doubt that it’s the most powerful self-help guide ever published. TK: How difficult was it to lay out in a form that people could understand easily? ES: Extremely. I needed a very thorough and precise knowledge of the subject matter so I could present it in a way that a complete novice could follow and apply. The human brain is the most complex known object in the universe, so neuroscience in itself is incredibly challenging to learn, but over the course of two years, while researching and writing The Path, I sought out Nobel prizewinners like Eric Kandel and Elizabeth H. Blackburn, and studied lectures from Yale, Oxford, Cambridge, Harvard, MIT, Stanford and Berkeley. I was lucky because many prominent scientists graciously gave feedback and permission to use some of their photographs and other information, and I spent a great deal of time making detailed illustrations as well. It’s all been thoroughly vetted by my editor as well, Dr. Vicki Swier. TK: What type of research went into putting together a project like this? ES: Well, it teaches basic biology, neuroscience, some chemistry and physics, genetics, anthropology, exercise physiology, nutrition, and applied psychology. It’s the condensed essence of some three dozen books, several hundred lectures, and as many academic papers. TK: Is The Path for all ages? Who can best put this book to use? ES: I would say from about the age of 14 upward. In fact, the younger someone starts to read this book, the greater an impact it will have on his or her life. body. Can you give us an example of the tips readers would find in The Path? ES: Absolutely. Central to the book is the theme of habits, and how to master them. Sigmund Freud once famously said, “Biology is destiny,” but now we know that’s not entirely true – it’s only about half of the equation. I’d respectfully paraphrase that to say “habit is destiny.” Master your habits and you master your destiny. And we’ve mapped out the specific neural circuits responsible for forming habits. At the heart of it is the so-called “dopamine reward pathway,” in the deepest center of your brain, also called the mesolimbic pathway. Within the last decade, we’ve begun to learn the fundamental principles by which this master circuit works – and how to use that knowledge to your advantage. We now know very precisely why a piece of information gets selected for memorization, how it’s solidified as a memory, and how to keep that memory strong. The reason a piece of data is selected for memory by your brain is based upon the principle of “salience” – personal relevance and importance for your survival. Your brain’s memory generator – the hippocampus – maintains impressions of temporary sensory input – sights, sounds, sensations, tastes, smells – as neural links called “memory traces,” neurons connected by synapses, across which signals flow. The alarm center of your brain called the amygdala chemically “marks” certain collections of these sensory impressions (experiences) as important to your survival. While you sleep, these salient memory traces are transferred from your short-term memory center in your hippocampus to your massive outer brain – the cortex – for permanent storage. Every time you recall these memories you restrengthen the synaptic connections, making the information easier to retrieve and more solidly fixed in your mind. Your memories are organized in a web-like matrix of logical connections called schemata. Your schema for the word “green,” for example, might be associations (neural connections) for “forest,” “avocado,” “Kermit” and “emerald.” Each of these in turn also has its own schema. These are solid, robust networks of information you have built up through a lifetime, with very strong synaptic connections. Adding related information means memories are “hooked onto” these strong memory circuits, meaning the new related information is easy to both commit to memory and to recall. And the greater the number of neurons dedicated to a memory – physically connected by synapses, the easier it is to generate impulses that trigger that memory again, and the less likely it is to fade with time. So if each of your senses is involved in a memory, it’s both more vivid and easier to recall. Your hippocampus evolved from the rhinoencephalon – the ancient “nose brain,” that allowed animals to navigate, primarily using the sense of smell. Because your hippocampus is specialized for navigation, it encodes navigational memories using “place cells.” These cells fire at specific locations, in a specific order, so we know they correspond to actual locations. Because your brain’s main “memory generator” – the hippocampus – is built to help you navigate, you can use this powerful system to your advantage, placing items you want to remember along a visual route in your mind such as your commute to work, your house, or even an imaginary castle you’ve built in your head. This is precisely the same technique used by the world’s greatest memory champions, who can, like Dr. Yip Swee Chooi, memorize every entry IN ORDER of the entire 1774-page Chinese-English dictionary WORD-FOR-WORD. It’s called the Method of Loci, anyone can do it, and my book teaches you how, step-by-step. We also know that cortisol, a stress hormone, enhances synaptic formation at low levels, but impairs it at high levels, so the positive stress of a challenge enhances learning but negative stress (such as a noisy, uncomfortable, or overly competitive environment) impedes it. In fact, chronic, high-level stress is neurotoxic to the hippocampus – it actually appears to eventually destroy the very nerves critical for memories – at the heart of everything you do in life. Serotonin is a neuromodulator, meaning it functions as a sort of neural valve, controlling signal flow through your brain and body. It also has a calming, mood-stabilizing effect. And glucose – blood sugar – is consumed by your brain more than any other organ. When you skip meals, it depletes your brain of both of these vital biochemicals, and your thinking becomes muddled, you find it difficult to focus, and you feel irritable – stress. Caffeine affects another neurotransmitter called GABA, which inhibits (dampens) neurotransmission. Caffeine inhibits this inhibitor, thereby making you more alert. Over time, however, your body builds up a “tolerance,” so it doesn’t have as strong or as lasting of an effect. 5) engage as many senses as possible in forming that memory – write the information, say it out loud, listen to related lectures, watch demonstrations, and even make gestures. The more senses you engage, the stronger that memory trace will be. TK: Where can readers find out more about The Path and your work? 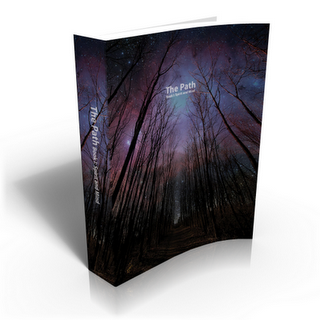 The Path is currently available in black and white paperback, color PDF and kindle formats. It’s available for purchase at a discount directly via my website and distributor (Ingram – which allows me a better share of the cover price), or via Amazon.com and Barnes and Noble. Thanks for the info, Eric! Hopefully some New Years Resolutionists put your book to good use! Thanks so much for the opportunity to share with you and your readers!